"A portable utility to obtain low-level application windows information"
The developers among you might be particularly interested in the freeware product presented here, called SpyEx. It will display all visible and invisible windows, including the Windows messages for each one. For instance, you could use it to spy on a particular application’s messages or even to display the DOM structure of HTML pages. 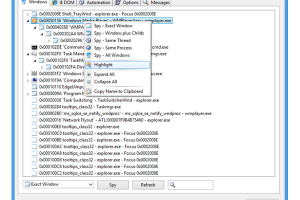 SpyEx features a graphical user interface and configurable options to show only specific messages, for instance buttons or list boxes. Note that this is a portable application and as such it might serve your troubleshooting needs anywhere and anytime if you include it into your removable USB drive’s toolkit. So, if interested in this particular application, proceed to the download to find out more about its features, to save it to your USB Flash disk or to start using it right away.